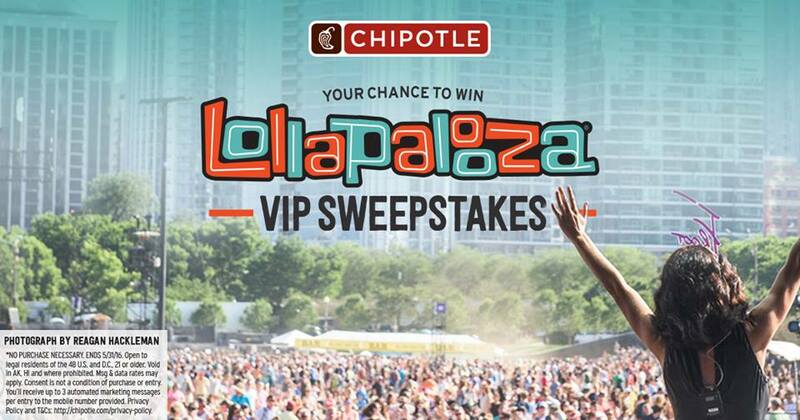 Chipotle is giving away a whole YEARS worth of FREE Chipotle burrito and taco gift cards along with a trip with VIP Tickets to attend this year's hottest music event, Lollapalooza! GRAND PRIZE: A trip for Winner and up to three (3) guests to the Lollapalooza Festival in Chicago, IL from July 28, 2016 through July 31, 2016. Prize includes Four (4) 4-day VIP Passes to Lollapalooza -Approximate Retail Value (“ARV”) $8,800; Round-trip coach air transportation from major U.S. gateway airport closest to Winner’s residence ARV $1,600; Six -day, five night hotel accommodations (2 rooms, each double occupancy) ARV $3,000; Chipotle Burritos for a Year awarded in form of fifty-two (52) Chipotle Burrito Cards (up to a value of $10 each card) to be redeemed at any participating Chipotle Restaurant. Terms and conditions of the Burrito Cards will apply. ARV $520; Free Chipotle Tacos throughout Lollapalooza ARV $500; Lollapalooza 25th Anniversary SWAG Bag ARV $250; Airport transportation credit of $100. Total ARV of Grand Prize package: $14,770.00. HINT: If you prefer to enter via Text To Win instead, simply send the keyword CHIPOTLE to shortcode 888222 and there are other keywords if you'd rather use something else. See the rules for details.